In addition to watching the price of a specific asset, it’s important to monitor other indicators as well. 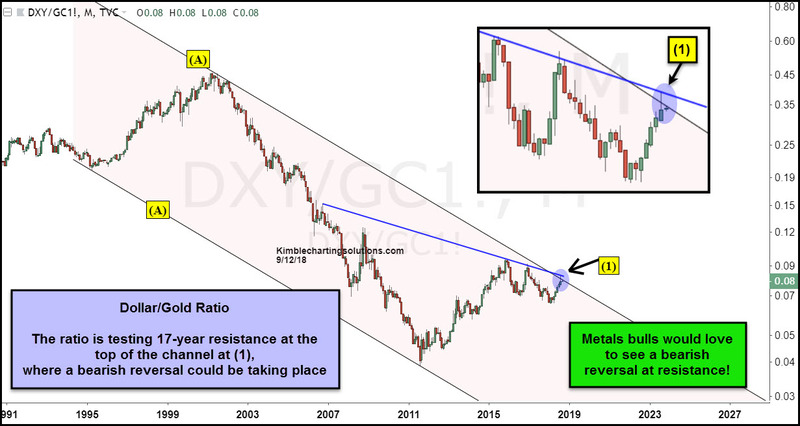 For precious metals and gold bugs, the U.S. Dollar Index and Dollar based ratios can be helpful. Today, we re-visit the ratio of the U.S. Dollar Index to Gold. When the Dollar (NYSEARCA:UUP) is stronger than the price of Gold(NYSEARCA:GLD), the ratio moves higher… and when the Dollar is weaker than gold it moves lower. Gold bugs and bulls like to see this ratio move lower. The ratio has been moving in a wide declining channel for 17 years (point A). That said, it’s been rallying higher for the past 7 years, making it hard on the precious metals sector. But the ratio has recently bumped up against the upper channel resistance, where a bearish reversal may be taking place! Metals bulls would love to see the 17-year channel resistance hold at (1)… and lead to a move lower. Gold bulls want/need this to hold!!! If the ratio would breakout to the upside, it would send a strong bearish message to Gold bugs.